Franz Kessler GmbH based in Bad Buchau, Germany, has named NSK Deutschland GmbH its supplier of the year in the category of on-time delivery. Kessler is the largest European producer of motor spindles for the machine-tool industry and its components are often fitted with NSK’s high-speed bearings. NSK has developed a wide range of bearings for applications in this sector, which fulfil the industries exacting requirements regarding precision and durability. 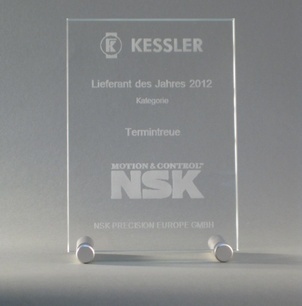 With the award, Kessler is honouring NSK for its flexibility and for complying exactly with promised delivery dates. NSK produces many of its bearing series for machine-tool applications at its high precision plant in the British town of Newark. This helps the company deliver parts promptly because it makes for shorter distances and faster reaction times. For example, the angular-contact ball bearings from the ROBUST and ROBUSTSHOT series – which are often used in spindle drives – are manufactured in Newark. Even individually engineered components don’t have far to travel: for example, operating conditions can be replicated for load testing at the European Technology Centre (ETC) in Ratingen, Germany, to ensure that specific bearing series are suitable for particular application scenarios.